On Friday 26 August, Johann Nothnagel (61) leaves Cape Town in an attempt to ride over 4 000 km in support of people with multiple sclerosis (MS). The illness makes riding a motorcycle over such a great distance extremely hard, but biking is something Johann, a software developer, has always enjoyed. This lead to the first Unchaining MS ride in 2011. Johann’s bike at the time, a Buell Firebolt XB12R, was belt-driven, in stead of the more common chain drive. And so “Unchaining MS” was born and Johann completed it on the Buell, riding solo most of the journey. Johann’s message when he visits MS support groups and pwMS (persons living with MS) around the country is this: MS doesn’t mean giving up on everything you enjoy doing. Through the media and interaction with groups and individuals, Johann aims to give people a better understanding of the condition. Unchaining MS raises funds too. Hyundai, Kawasaki, Sintrex and a private donor are this year’s logistics sponsors, so all monies raised go to MS South Africa for the support of its members. More specifically, it’s used for financial assistance of PwMS, home visits (where possible), counselling, support groups and info talks, a volunteer programme, workshops, advocacy, resources, referrals and guidance. 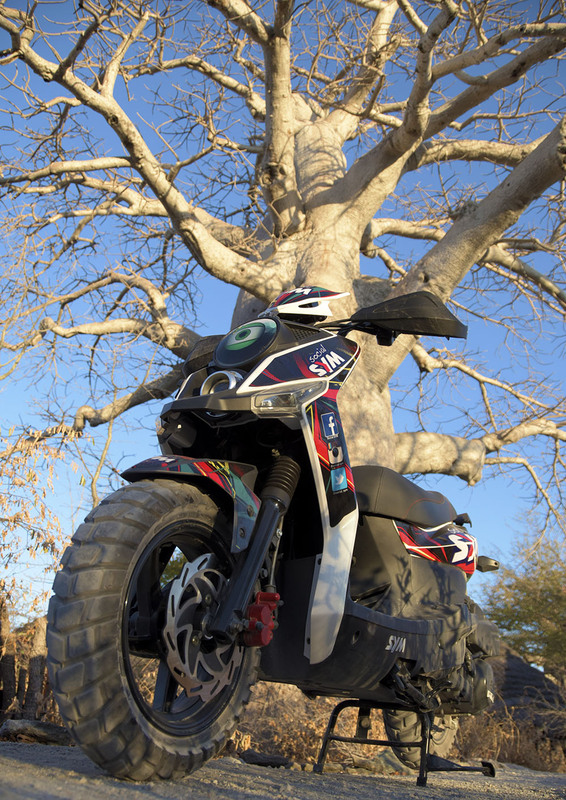 “We invite all bikers to join us on the road to show their support or donate, or just because they enjoy the feeling of freedom that comes with riding,” says Justus Visagie, co-rider and co-organiser. “If you’d like to meet up with us, on the road or in your city or town, please contact us before we pass through,” he says. 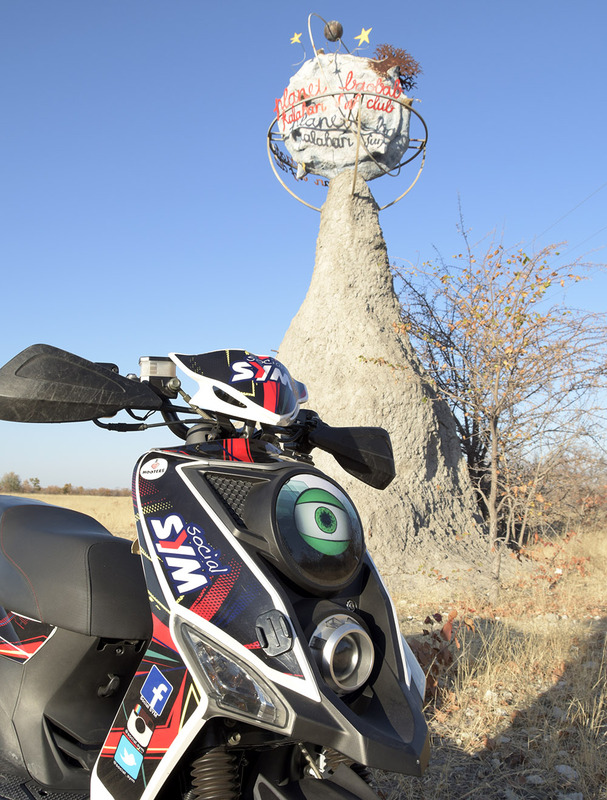 In 2013, Johann rode a Triumph Tiger 800 and he was unaccompanied for most of the journey, as in 2011. This year there’s a team of three: Johann on the Kawasaki Versys 650 and Justus and Stephan Lourens taking turns to ride the Versys 1000 and drive the Hyundai H1 Panel Van. The van can transport a bike if the team encounters a serious problem. The group leaves Cape Town at 13:00 on 26 August and spends their first night in Barrydale. 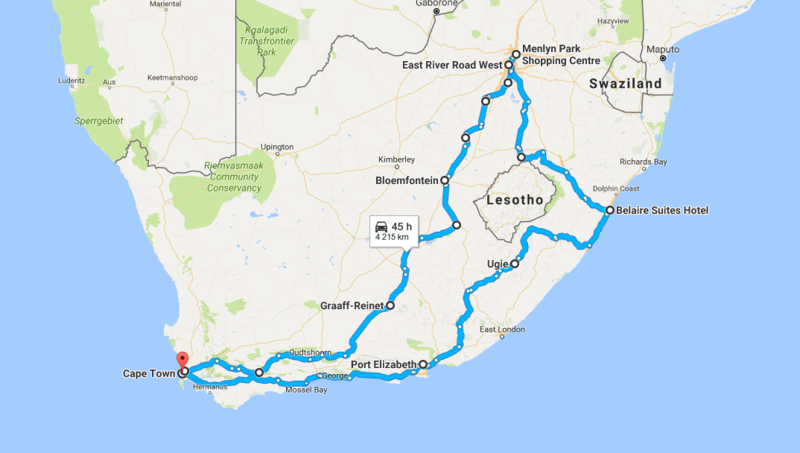 The major cities on the route are Bloemfontein, Johannesburg, Tshwane, Durban and Port Elizabeth (full list below). MS Unchained 2016 should reach the Mother City again on 7 September. Make a deposit to MSSA WC, Standard Bank account no. 0730 84 697, Tyger Manor branch code 05041000. Please reference Unchaining MS. Tax certificates available on request. Pay with WeChat or SnapScan from a smartphone. WeChat will credit users for all donations made with the WeChat Wallet, up to R200 per payment. So if you give R200, you WeChat Wallet is credited with R200! Use the QR code to the right. If Johann or Justus do not answer, please message or e-mail them. Before being diagnosed with MS, Johann didn’t have comprehensive medical aid cover, so he ignored the strange symptoms he experienced over a number of years. Decision time came when he joined a group of friends for a walk on the beach at Mossel Bay and was shocked to find that after 500m he did not have the energy to pick up his right foot from the beach sand. In 2009 Johann was diagnosed with relapsing-remitting MS. Finally he could put a name to what had become his way of life. The diagnosis could not dim his passion for motorcycles. Johann is a true biker, enjoying the open road and all aspects of motorcycling since age 16. He owns a Triumph Tiger 800 and rides it despite these symptoms – a weakened right leg, (left leg also starting), almost permanent leg pain, regular leg spasms, regular severe headaches, needles and pins in hands and feet, permanent tinnitus in both ears and severe fatigue. Johann loves his two Jack Russell Terriers, Lula and Mila, his constant companions. But it is the MS community that has his heart. It is their needs that Johann wishes to bring to the attention of the public. – Non Smit, Director, Multiple Sclerosis South Africa Western Cape. Multiple sclerosis (MS) is an illness of the central nervous system. For unknown reasons, the immune system attacks the body, damaging the myelin coating around nerves, which causes messages from the brain to not reach their destination. This damage to the nervous system affects people in different ways, but all MS sufferers experience extreme fatigue, find it hard to balance, and may find all or some of their senses suddenly not working as they did before. MS cannot be cured and often has a devastating effect on the lives of the person with MS and his or her family and friends. Visit Multiplesclerosis.co.za or Facebook.com/multiplesclerosisSA. Livia Lancelot clinched the FIM WMX World Motocross Championship for Kawasaki today at Assen in northern Netherlands; after 2008 it is the second world title in green for the Team 114 girl. The 28 year old from France started the weekend quietly to earn fifth choice of gate at the start, but her immaculately prepared Kawasaki KX250F got her to the first corner with the leaders while her sole remaining rival for the title fell on the opening lap. Determined not to take any risks Livia made no attempt to stay with the race leaders, and the inevitable nervous tension as the world title came closer led to her making many mistakes on the tortuous sandy track; she eventually came under pressure from behind, surrendering third place as a lapped rider got in her way. Although faster on many sections of the track she could not make a pass stick to regain third place and her title rival, a Dutch girl, closed onto her rear wheel in a desperate attempt to keep the destiny of the championship open. Eventually the Dutch girl touched Livia’s bike from behind, but justice was seen to be done as Livia maintained control of her Kawasaki and her rival fell. They were again close on the final lap, but Livia, in the knowledge that the title was secure if she stayed in front, remained cool to the finish to be greeted by her team, family and friends as 2016 FIM women’s world motocross champion. 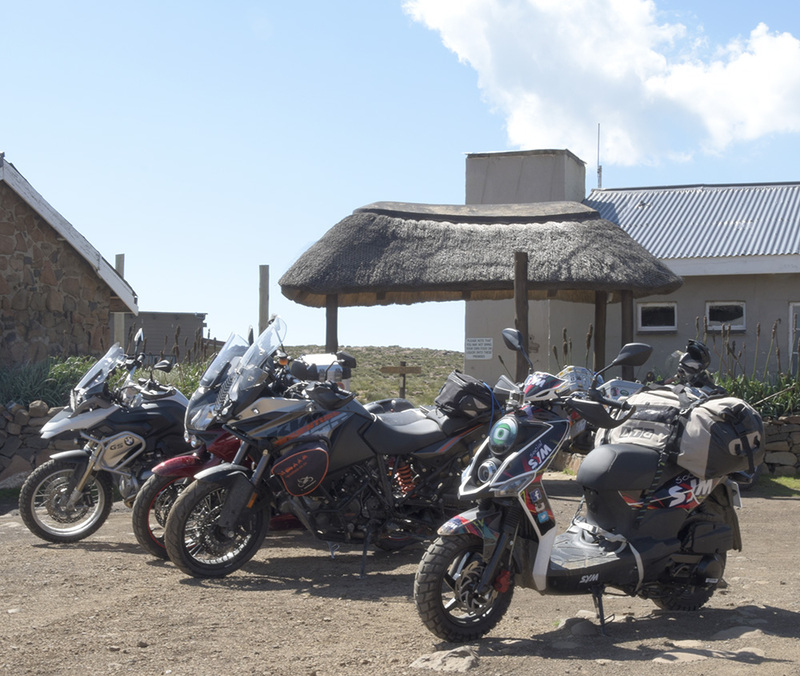 I suppose the idea germinated whilst in the company of some Adventure bikes at the top of Sani pass. They were somewhat miffed at the ease with which Social shot up the pass! 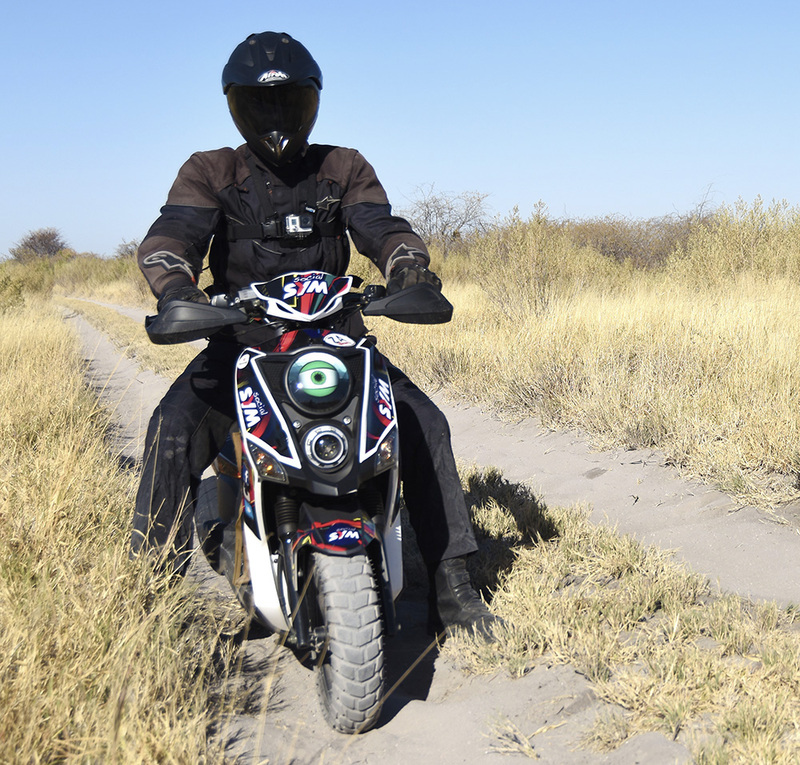 “Real adventure bikes travel far and wide, conquering sandy tracks and riding desolate plains like the Makgadikgadi in Botswana”, they said. “You need a big engine and big, 19 or 21 inch wheels like us”, they said. “You could never manage that”, they sniggered. Being a modest fellow, Social said nothing; however that heart of a lion under his funky bodywork started idling a little faster as an idea was birthed. He would conquer those far away challenges and prove that just because you are little you can still dream big! If you are properly built, by people who care, you are up for any adventure. So it was that on a day, he travelled north to a place called Nata in the wild and wonderful country of Botswana. Deep sand tracks would take him to the fabled Makgadigadi pans. He was a little apprehensive. Those deep sand tracks through the Mopani trees are hectic! Many big Adventure bikes have tried and failed, their riders falling off and lying exhausted in the sand, too tired to continue. “My wheels are small, but they are quite wide, so I will make my front wheel a bit softer, say 1.6 bar and I will go where others fear to roll, he said with resolve”. His big day dawned and he rode out under an endless blue Botswana sky. Tank full and a 5 litre fuel bladder hanging from his parcel hook. Off the tar road and the deep sand track started immediately. There is only one way! Throttle wide open and you can’t lose! The track twists and turns every few meters through the Mopanis. The sand did its best to stifle his progress , but full throttle saw the plucky little scoot flying along at a pace that would have left the average adventure bike floundering. Really light weight and a torquey little motor saw Social SYM running on top of the sand like a little beetle, with the rider hanging on for dear life! The pans, oh the pans! Suddenly the track opened up and before Socials green eye gaze lay the endless pans, stretching out as far as the eye can see. With an excited toot of the hooter, he bounded forward. Amazingly there was water on the pans, remnants of early winter rain! Drinking from the pan was a large herd of magnificent wildebeest. Like a Jack Russell after a ball, Social SYM streaked across the white pans to take a closer look. 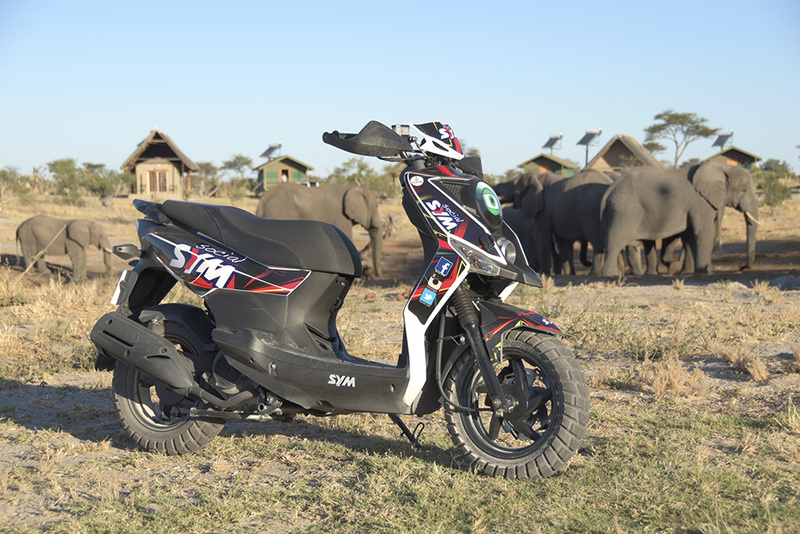 Not being accustomed to funky scooters appearing out of nowhere, the startled Wildebeest snorted, tossed their heads and wheeled about. 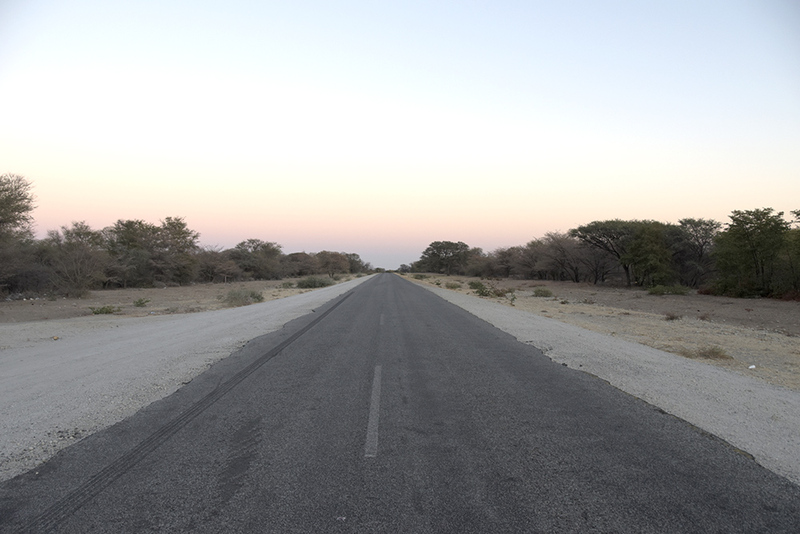 Social found himself rolling across Botswana’s Makgadikgadi accompanied by more than forty free roaming Wildebeest. Not wanting to spook the heard, he kept his distance, and then turned around to retrace his tracks. Once again Social proved that it is not the size of your ride that counts, but rather the size of your sense of adventure! 50 odd kays north of Nata, Social turned into Elephant Sands for a bit of well-deserved rest. Watching the sun set on another perfect African day, this time in the company of around a dozen huge African Elephants drinking in front of the lodge, Social revelled in his latest adventure. The “Kalahari Surf Club”? Planet Baobab? I have to see it “said Social, so off he went. What a place! The huge red glowing Baobabs, baking in the setting sun, served as a perfect backdrop to our intrepid tiny traveller. The smirking big adventure bikes would get really hot under the handlebar when they heard of his latest exploits. If he told them they would probably never believe him . Luckily he has the photos and video’s to prove it! 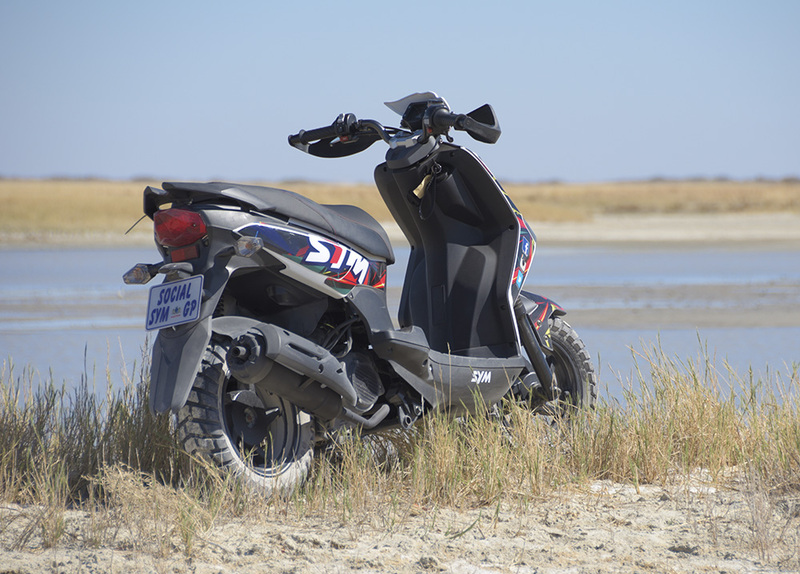 Author Crescent BikesPosted on 16 August 2016 Categories Motorcycle NewsTags Social SYMLeave a comment on Social “Sandy” SYM rides the Makgadikgadi Salt Pans in Botswana! The Bennetts Suzuki team has unveiled a special livery for this weekend’s MCE British Superbike round at Brands Hatch, which celebrates the 40th anniversary of Barry Sheene’s maiden world title. Inspired by the famous livery of Sheene’s XR14 Suzuki, which he rode to world championship glory in 1976, the team’s GSX-R1000s will run in the famous Heron Suzuki colours at a circuit that Sheene himself enjoyed great success at. The weekend at Brands Hatch also marks 40 years since Sheene won the last international Hutch 100 race, which raced anticlockwise around the Brands Hatch circuit. Barry Sheene’s 1976 and 1977 world championship-winning bikes will also be on display over the course of the weekend. Tommy Bridewell is eager for a return to the podium at Brands Hatch, having made big steps forward with his Bennetts Suzuki after a positive outing at Thruxton and productive two-day test at Cadwell Park. His team-mate, Ryuichi Kiyonari is also confident of a good weekend, coming off the back of a strong showing at the Suzuka 8-Hour race in Japan where he finished sixth with Team KAGAYAMA. The former champion was also on the pace at the Kentish circuit earlier in the season before suffering a broken collarbone, and is looking to make strides towards the podium this weekend.